We've looked up. What about the other direction? Franz Josef Glacier, New Zealand. In one sense, looking down is a lot easier. There's a lot less down than up, for starters. Up goes for billions of light years. Down only goes as far as the centre of the Earth before it starts going back up on the other side. That gives us about 6370 kilometres to talk about, the radius of the planet we share. The uppermost layer of the Earth we are all familiar with. It is the realm of our everyday lives, the boundary between Earth and the atmosphere above. This is the region we, and all other terrestrial animals and plants, live in. It contains materials that are very familiar to us: dirt (or "earth", after which our entire planet is named), rocks, sand, mud. In some places we can find variants like clay, or salt. Much of this layer is covered with a heaving, crawling, breathing carpet of living beings. In one sense, the animals and plants and fungi and bacteria and other living things are very much a part of the Earth. They share its constituent matter, cycling it through their bodies, converting inanimate bits of the Earth into living tissue. And when they die and decay, that matter is returned to the Earth. But there's one more very important substance that sits on the surface of the Earth: water. And there is a lot of it. If you live inland, in an arid region, it may not be so obvious. But if you live in one of the great coastal cities that we love to build, or otherwise by the seaside, you know that just beyond the margins of the land is a vast, trackless, seemingly endless expanse of water. The oceans cover some 71% of the surface of our planet. Then there's fresh water overlaying the land as well, in the form of rivers and lakes. 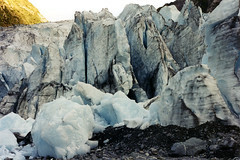 And there's ice too: glaciers and icecaps. Water falls from the sky as rain, snow, and hail, covering the ground with a layer of water that runs off into streams and rivers and down to the oceans. Energy from the sun evaporates water from the ground and oceans back into the sky, so it circulates around the planet in what is known as the water cycle. Some water seeps into the ground, through porous layers of soil and rock. In one particular form of rock, limestone, this causes interesting results. Water can absorb carbon dioxide from the air, which makes it into a weak acid, sort of like a fizzy soft drink. Limestone is a type of rock made, over millions of years, from the compressed shells of marine creatures. It is composed mostly of a compound called calcium carbonate, which happens to dissolve in weak acid (unlike most rocks). As the weakly acidic water seeps through the limestone, it dissolves small channels in the rock. Over thousands of years, those channels can grow into vast caverns. This is the origin of many spectacular cave systems. Spectacular because the slow trickle of water, now laden with dissolved limestone, into such caves leaves behind small deposits of that stone when it drips off ceilings. Over time those deposits grow, extending downwards like icicles, and forming the beautiful formations we know as stalactites. 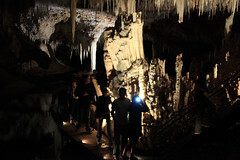 The drips of water landing on the cave floor also leave stone deposits, which grow upwards as stalagmites. Sometimes the -tites and the -mites join in the middle to form columns of stone. Similar processes form dozens of other wonderful stony displays in limestone caves. You've certainly seen pictures, but if you've never visited a cave system, take the time to do so one day. Many are open for tourists and relatively easy to access, and there's nothing like seeing limestone cave formations with your own eyes. 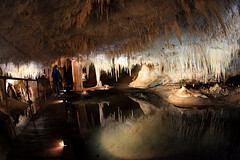 Stalactites and other formations in Lake Cave, Western Australia. There are other forms of caves. One sort is dug out of rocky coastlines by the action of waves - these are called sea caves, the sort Dumbledore and Harry Potter investigated together in Half-Blood Prince. Another type of cave appears in volcanic rocks in the form of great tubes that look like they've been hollowed out by a giant worm of the most monstrous sort. These are lava tubes, tunnels through which molten rock at one time raced during volcanic activity. When the volcanism is over, the lava can drain away, leaving behind glistening tubes in the rock, large enough to drive cars along. Lava comes from deep beneath the surface of the Earth, but we still have a couple of things to deal with on top of it first. Some water, as we've seen, filters down through soil and porous rocks like limestone. How far down does it go? Eventually, it will hit a layer of non-porous rock, and there it begins settling, forming a sort of underground reservoir. Underground regions saturated with water like this are called aquifers, and the top surface of the aquifer (remembering it's not like a lake surface with just water and air, but it's water soaked into porous rock, like a sponge) is called the water table. If you live in an arid region like a desert, there is often water hidden underground. It has spread there underground, supplied by rainfall and runoff from elsewhere, often wetter places hundreds of kilometres away. You can get to it by boring a hole. Once your hole reaches the level of the water table, water will continuously seep out of the rock and fill the hole to the same level. We call such holes wells. 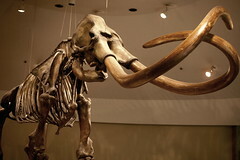 Mammoth skeleton, excavated from La Brea tar pits, Los Angeles. Just as there are porous regions underlain by non-porous rock, into which water can settle like a vast underground lake, there are also porous regions with layers of non-porous rock above them. With water pressing up from below, these regions can form "bubbles", like the air bubble inside an upside down glass if you push it into a sink of water (except remembering they are still full of porous rock, not air). Trapped inside such bubbles can often be found the decayed remains of plants and animals, buried millions of years ago by rocks forming above them. These long-decayed remains are natural gas and petroleum. These substances are lighter than water, so they tend to float on top of the water table. If the rock above is all porous, they can seep right to the surface, forming natural pits of tar, such as can be found in the Los Angeles district of La Brea, or the Pitch Lake in Trinidad (also near a place called "La Brea", which is not that surprising since "la brea" means "the tar" or "the tar pit" in Spanish). In other cases, as mentioned above, they can be trapped like bubbles under a layer of non-porous rock. If we drill down into those bubbles, it's like cracking the upside down glass in the sink of water. In that case, the trapped air rapidly bubbles to the surface of the water. Similarly, when an underground petroleum deposit is breached, the pressure of the water table below pushes the oil up to the surface, sometimes under immense pressure. Besides the organic molecules of natural gas and oil formed from old decayed plants and animals, living remains can also be transformed into fossils. This can occur when water with dissolved minerals seeps into a dead body, carrying away the soft organic tissues, but leaving behind newly formed rock in the same shape as the dead body. These fossils can then be exposed millions of years later, either by natural erosion or by digging for them. It's fortunate that this happens, because fossils allow us to know and understand the rich pageant of life on Earth over the past four billion years. Lava erupting from the Earth. 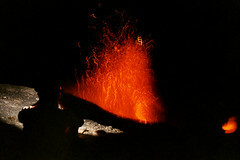 Stromboli, Italy. At depths ranging from a few kilometres down to around 90 kilometres, depending on geographical location, there is a sudden change in the properties of the rocks. Above this boundary, called the Mohorovicic discontinuity, lie all of the surface features and near-surface features that we are familiar with - the outer "crust" of the Earth. In fact, that's what the top layer of the Earth is called, the crust. The new region below the Mohorovicic discontinuity is called the mantle. The main difference between the crust and mantle is thought to be the composition of the rocks, but this is something that geologists are not entirely sure about yet, because no hole has ever been drilled deep enough to test the rocks directly. But we haven't explained where the lava comes from yet. 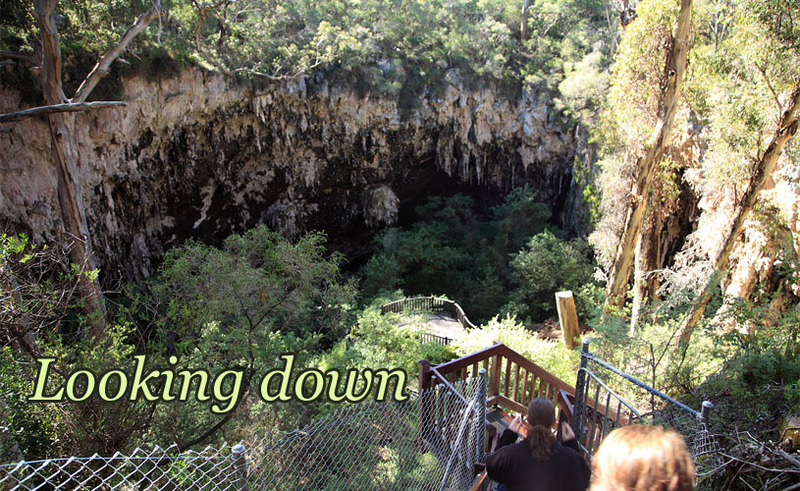 If you descend into the Earth a little way, you'll notice it's quite cool underground. At least at first. If you go very deep, such as in a South African diamond mine, you'll find that the temperature underground gets hotter as you go deeper. Where is this heat coming from? The answer is that it's being generated in the rocks! The heat comes from the slow radioactive decay of elements like uranium. I'll talk about radioactivity another day, but for now it's basically a way in which some elements release some of their potential energy slowly over a long time (nuclear potential energy in this case, which will also be explained later). It's a slow trickle of energy, but there's a lot of rock underground. Near the surface of Earth the heat escapes, but underground it builds up, until eventually, at about 100 kilometres deep, it's hot enough to... not melt rock, but make it kind of oozy, like putty. At this depth, the rocks of the mantle stop being rigid like the rocks we are familiar with, and become more like a very slowly oozing mass of treacle. This is not completely molten like lava, but sort of partway there. Structure of the Earth. Adapted from Creative Commons Attribution-ShareAlike image by Dake, from Wikimedia Commons. The radioactive decay deep in the Earth heats the oozy rocks of the mantle. Unevenness in the heating makes some parts of the mantle a bit hotter, and consequently a bit less dense, than other parts. The hotter, less dense bits start rising, ever so slowly, pushing cooler, more dense rock out of the way and making it sink. This sets up what are called convection cells, where the mantle flows around in big vertical circuits. You can see convection caused by heat in more familiar substances like boiling water if you add food colouring or particles like rice. In the mantle, the convection currents are very slow, but also very powerful. The flowing oozy rock drags great chunks of the more solid rock above (both the upper, rigid mantle, and the crust) with it, like leaves floating on moving water. And so the surface of the Earth is not still. Rather, it moves about in enormous sheets on the flowing mantle beneath. And where the sheets meet, they grind together. This grinding is usually very slow - the order of tens of millimetres a year (about as fast as fingernails grow). But occasionally the sheets suddenly slip a bit, causing what we call an earthquake. The sheets are called tectonic plates, and there's plenty more to say about those another time. Back to the mantle. The mantle does not extend all the way to the centre of the Earth. 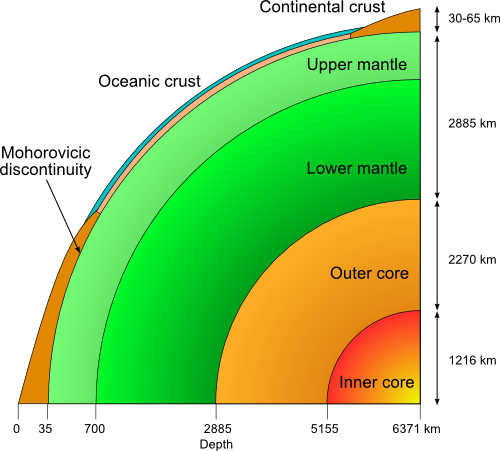 Deeper still is the Earth's core, which has two layers, an outer one like a shell, and an inner core which is simply a solid sphere at the middle of the planet. The outer core is truly molten and is made mostly of iron and nickel. The inner core is made of the same material, but is solid. How do we know what the interior of the Earth is like? Nobody has ever been or drilled more than a few kilometres down, not even enough to reach the mantle. We can't see what's down there. But seeing is only one method of sensing things - we can also hear and taste and smell. And in a sense, hearing is how we know about the internal structure of the Earth. 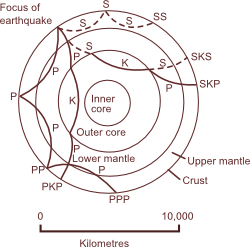 Propagation of seismic waves through the Earth. Adapted from public domain image by United States Geological Survey, from Wikimedia Commons. When earthquakes occur, they set up vibrations in the Earth, similar to sound waves in air. These vibrations, called seismic waves, travel through the Earth and can be detected by seismographs (earthquake detection machines) hundreds or thousands of kilometres away from the earthquake site. There are many different types of seismic waves, but the important thing to know about them now is that they travel at certain speeds through the Earth that depend on the properties of the material they are passing through. Now if you remember what I said about light travelling across boundaries between substances, where its speed changes, you'll understand that when a seismic wave passes through a boundary between different types of rock, it bends. If you draw a map of an earthquake, showing how long it takes the seismic waves of various types to reach detectors at different distances, you will notice a peculiar thing. At certain distances from the earthquake, there are sudden jumps in the arrival times of some seismic waves. At other distances, some waves fail to arrive completely, yet they arrive at stations further away. The resulting pattern of jumps and non-arrivals is explained by the fact that the seismic waves are bending at specific layers deep within the Earth. Some of the bends change arrival times, and some of them mean that stations at certain specific distances never receive the seismic wave at all, even though stations further away do. We can combine this information with knowledge about densities and properties of rocks at various temperatures and pressures to build up a pretty good picture of what lies deep beneath our feet. It's sort of like a CT scan of the Earth. In the same way that a CT scan builds up a detailed picture of your insides, without a doctor needing to use a scalpel and go have a look, seismic waves from earthquakes give us a detailed picture of the structure of the Earth. Next time you go outside, stop and think for a minute about the amazing variety of things under our feet. I don't want to talk about the atmosphere today, as that's really looking up, not down. Maybe another day - it's a story well worth telling all on its own. From the Greek "petra" meaning "rock", and "olea" meaning "oil". In terms of etymology at least, petroleum is literally "rock oil". Last Modified: Sunday, 23 February 2014; 02:10:30 PST.